A new study, published in Nature, reveals the molecular mechanism behind the fight of “good” bacteria against pathogens — a potential alternative to antibiotics. Staph infections are caused by bacteria of the Staphylococcus type. These bacteria might be on you right now, but its only when the protective barrier of your skin is broken – such as in a small cut – that they become dangerous. Nevertheless, staph infections are relatively easy to treat, and your doctor is most likely to suggest antibiotics. That is, unless the bacterial strain is the dangerous super-bug MRSA (Methicillin-resistant Staphylococcus aureus), a highly contagious and antibiotic-resistant staph type. Instead of antibiotics now, probiotics might be the solution to keep any staph infection away. In their study, Dr. Piewngam from National Institutes of Health (NIH), USA, and his colleagues looked into the gut microbiota of rural populations of Thailand. 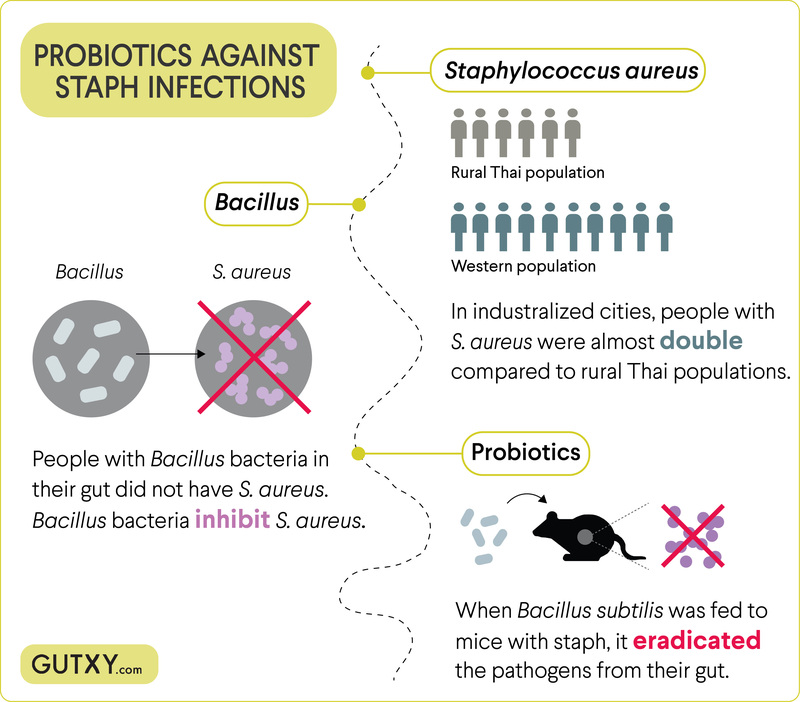 They found that, compared to the average “western” gut microbiome, the presence of Staphylococcus aureus (a dangerous strain of staph) was significantly lower. Only 12.5% of them had S. aureus in their gut, while up to 20% of people living in urbanized areas are commonly carrying the pathogen. The scientists thought that their gut bacteria composition could explain this difference. However, the overall composition between S. aureus carriers and non-carriers was the same. Strikingly though, every person that had any type of Bacillus bacteria in their gut – which was 50.5% of all people tested – also did not have S. aureus. That means that bacillus bacteria can prevent pathogenic staph from growing in peoples’ guts. But how?